My name is Tori I’m 26 and live in Florida (and I like long walks on the beach, blah, blah, blah). I’m pretty new and early in the transition, about three weeks ago I decided to research how to embrace my natural 2b/2c wavy hair. Found/read the Curly Girl Method, I said goodbye to straightening my hair (i’ve done both chemically and with heat since I was about 11), threw out all of my brushes and dumped all of my sulfate and silicone filled hair products. In this time, I’ve learned a ton about hair. After several weeks of trail and error wash days, I’ve gotten together a good group of wash day products that work the best for my high porosity, low density, glycerine intolerant, color treated hair. I have pretty good washng and styling routines as well that has kept my scalp and hair pretty happy. Since I’m trying to wash my hair less, I need a 2nd day and 3rd day routine that works for my hair in transition. I do all of the nighttime routine stuff but the actual second day is always just kinda sad lol Right now, I use the Camille Rose Lavender Sprizter, I really like it since using water frizzes out my hair...but when i put it with other products, it’s no good. 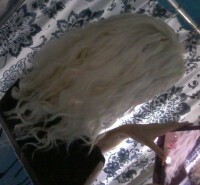 My hair gets weighed down, looks wet and frizzes it out...no matter what.. Anyone have any recommendations for second day hair, including products (low to no glyercine perferred) and routine? I’ve watched several second day hair routines on YouTube, including the Naturally Curly one, tried them all and the results have all over the board. Anything for this newbie would be greatly appreciated! It's taken me a long, long time to figure out second day hair. What I do now is I start with dry shampoo (Batiste - it has drying alcohols, but no silicones). Spray my scalp, then hang my hair upside down and sort of finger scrub my scalp to distribute it. Then I add dampen my hair using my hands and a praying hands method. After that, I'll add a little gel or conditioner, depending on what I think my hair needs. I use the same product I used the first day. Just a teeny tiny bit, applied with wet hands. Absolutely no hand scrunching at this point! I use my hair towel and a rope squeeze method to get rid of excess water, then gently gently scrunch upwards ever so slightly. Then I clip the top so I don't end up with straight hair on my crown, and let it air dry. Once dry, I scrunch and ruffle until it looks good. I actually like my second day hair better than the first! But it took a LOT of experimenting to figure it out. I have similar hair properties as you with 2b/c hair that is highly porous and bleached. It took me a year to be able to do second day hair. I just got really good at updos for second and third day hair. I am an odd one here when it comes to refreshing though in the sense that I don't. I use a hard hold gel on "wash day" at night after the shower (eco styler argan oil one), scrunch out the crunch in the morning and go about my day. When I get home, pull as much hair as I can into a pineapple, sleep with a satin scarf and pillowcase. Next morning, flip head upside down, take down pineapple, fluff up roots with fingertips, flip right side up, re-position curls as needed, and go. Repeat for the next two days or so. Try different techniques since second day hair seems to be a learning curve and I personally believe linked to the products used on wash day. Best of luck, and your intro made me laugh so thanks! Second and third day hair definitely takes some time to master! 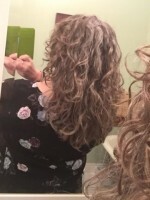 I have been following the curly girl method on and off for about 2 years now and have been getting 2nd day hair for a while but rarely manage to get 3rd day hair to do much more than a bun or braid until recently. I agree that it all has a lot to do with i wash day products. Also, I struggle to find refreshing sprays that don't make my hair look greasy and straggly. I know you said your hair doesn't like water on second day but one thing I've had some success with is adding a small pea size amount of gel into my hand and mixing it with water, then running that over my hair and scrunching, making sure my hands never get dry or sticky(more water and gel). Ive also had a lot of success with the Mixed Chicks Morning After Redefining Foam. It does a great job if calming freeze and adding definition back into my hair without weighing it down! Thank you for the tips and tricks! I’m excited to try these out!